Traditionally, in northern Ghana the kitchen is the woman’s domain. Unfortunately, this means women and their young children are disproportionally affected by the pollution from rudimentary stoves from burning wood, charcoal, and crop residue. It also means that women are forced to spend more of their day cooking with inefficient and time-consuming stoves and open fires. 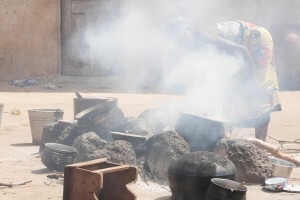 A woman in Ghana cooking on an open fire. Rudimentary stoves expose women and their young children to high concentrations of smoke and carbon dioxide, often within traditional homes that have poor ventilation. This can cause acute respiratory infections, chronic obstructive pulmonary disease, lung cancer, asthma and cancer. It also contributes to cataracts, blindness, and higher risk of stillbirth and early infant death. That is why Canadian Feed The Children (CFTC) and our three local partners RAINS, TAI, and TUDRIPED are working to introduce energy-saving stoves into 17 northern Ghanaian communities that require less fuel, produces less smoke, and saves cooking time. CFTC knows that simply providing new technology, like energy-saving stoves, will not result in sustainable solutions. In order to change practices and achieve long-term results, these initiatives need to be community organized, led and maintained. Our local partners enlisted community leaders to deliver training back to their communities in order to gain better participation and enthusiasm for the new technology. These community leaders facilitated discussions with their community members on the negative effects of burning biomass fuels when used in open fires or poorly functioning stoves, like producing large amounts of dust and smoke, wasting firewood, slowing down cooking time and contributing to climate change. 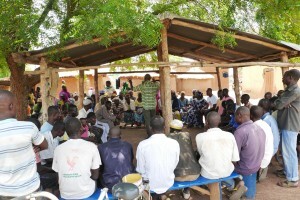 A community in northern Ghana gathering to learn. Each of CFTC’s local partners took a slightly different approach to this step-down training model, based on the needs and resources of the communities they work in. They utilized pre-existing male and female groups, like basket-weaving and farmer based organizations to access local community members. Partners reported high numbers of interested people because the training was conducted at the community level and used community resources. A unique success story from TUDRIDEP’s initiative was of the interest generated not only by the local women, but by the men of the community as well. Inspired by the community leaders, they defied gender role tradition and constructed the stoves for their wives, which has never happened before in the project communities in the area. In total, 2305 small holder farmers (1540 women and 765 men) in the 17 project communities were sensitised on the use of energy-saving technologies to reduce health and climate-based hazards. 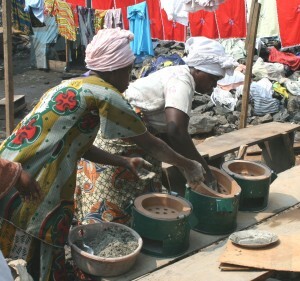 Women manufacturing energy-efficient stoves–an artisan craft that also provides a livelihood. Introducing energy-saving stoves through community leaders and trained artisans has also helped to provide alternative livelihoods for community members. During the construction of energy-saving stoves in the project communities for selected women, other women and men were given the opportunity to learn from the contract artisans on how to construct the stoves. 343 small holder farmers (290 women, 53 men) have been equipped with the construction skills necessary to support their respective communities in the construction and maintenance of energy saving stoves. By using a participatory and community-led model, our partners have ensured that community members have a sense of ownership over the energy-saving stove initiative. With the right leadership, knowledge, and skills, local communities are now empowered to drive their own sustainable change.